This video is intended to speak to the subconscious with it’s images and imaginary. I made this video some years ago. They should hurry with their New World Order, with the Anti-Christ temporary kingdom. Their time is short… TICK TOCK, they WILL be taken down and out, by G-d Almighty…. To light the mirror of the soul, is to make the unconscious conscious. Bring the dark side of oneself to light, to The Light. Some are able to do it, those with the Mark of the Beast are not able. Jesus Christ can do it FOR US in an instant. As a non-gnostic, not a fan of the mystery religions, I acknowledge G-d can only be reached by the circumcised Heart, not by intellect and knowledge. As if the Abbots can give any forgiveness for the extraordinary sins and evil this people is up to. What the world experience now is based on mystery religions with it’s roots in Egypt and Babylon, that is kept in secret societies, with High Priests, Rabbis and Abbots. – picture of 9/11, because that is when the main human sacrifice ritual took place, what started it all, setting the demons and the Devil loose and to their assistance, it gave them the never ending war on terror. The terror that shall last as long as needed and push through their evil agenda of the New World Order, Anti-Christ’s imperial kingdom on Earth. In Norway we had our own human sacrifice ritual taking place at Utoya/Oslo in 2011, 22/7. That’s when the demons and the devil was set loose on our society, by deliberate blood sacrifices by the satanic Cabal in high places, is planned and set in motion, and secured it’s cover-up by some insiders in power, normally greeted with some nice job in even higher positions, for service to The Prince of this World. After this the whole World politics changed. FEAR became the main weapon in their hand. It is a «falling away first».. who will se the good guys, who will see the good, and CHOOSE the good, and not the evil(s)? It is all about us, all about you and me, what we choose. The world’s a stage, serving the temptations, deceptions and lies, to cause the falling away first. It is for US to choose. It is not my problem what others choose.. I am not idolizing ANY man or woman from mankind’s ranks, because I know ALL of them is easily corrupted. I choose Jesus Christ, the Good Shepard. The carnal people of the flesh think they are gods in human form, but they are NOT! They will be judged and punished, righteously. The picture is G-d ‘in the sky’ looking down on us, are in control. Will take them out, when enough is enough, when the test they are in is over. They think they can make peace with brutality, violence and terror, with no love in their hearts. Politics can not make peace in the world. Only peace and love in the human hearts can make peace. The masses believe in them, and follow their lead, not knowing all is setup by demonic VERY destructive forces. Look at the sheep in front of TV listening to George W. Bush from Skull & Bones. 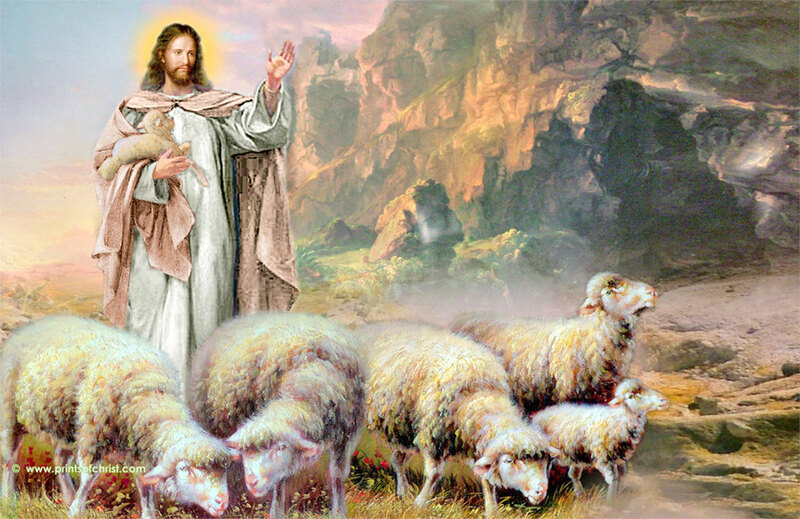 They are like lambs to the slaughter, and they have forgot The Good Shepard. They will actually legalize all that is evil, sinful, all kind of perversities, the anti-thesis of a civilized society, in order to have control of the destruction of our habitation. The Creator CAN NOT allow them to completely destroy His Creation, so He will take them down, in due time. The picture of the bird in the sky, free as he can be, with the special light over the mountains, there is G-d. There is the Spirit, that is eternal, what this Satanists that is orchestrating all this for their fame and glory, will have no place in. We were supposed to be free as birds, under the Free Will of Conscience, to develop human characteristics, but the opposite became the reality; they are breeding people to take The Mark of The Beats, herded like Animals..
02:50 When Jesus Christ, the spiritual King of this Earth and dimension is rising His hand, and say stop, than it is stop. Than the period of The Devils allowed temptations of mankind over. Whatever they do, they can not destroy the Love in some Peoples Hearts. They will NOT succeed, to get the full Control they aspire for, of all mankind’s hearts and souls by instilling FEAR factor in them, what they aspire to. They are all failures, unsuccessful, this people that aspire for fame and glory will have to take The Fall. Their spiritual ruler, called The Devil in the Bible, will be very angry at them for not being successful. Mankind is in its most evil and destructive time period of it’s existence. Completely lost in the darkest sphere of matter. When the light blast from the atomic powers they have invented for evil, not for good, in the background, the young couple in the street, there is Love, and than there is Everything. That part of them is promised Eternal Life, the carnal people will go with their carnal bodies. It is just fair. Ant there WILL be a Judgement Day. «The God of Abraham, Isaac and Jacob, the God of our fathers, has glorified his servant Jesus. You handed him over to be killed, and you disowned him before Pilate, though he had decided to let him go.» – Acts 3:13. Is there hope for the most evil people of this universe? Sure, if they get away from their evil ways, and repent…… and Change. Let Jesus Christ in to change their hearts, to be born again. «Greater love hath no man than this, that a man lay down his life for his friends». – John 15:13. Only love can light the mirror of the soul.